Each year, thousands of acres of land and many homes are destroyed by wildfires. 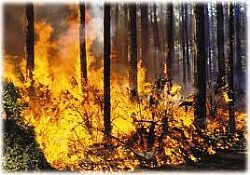 Droughts, lightning, burning debris or carelessness contribute to the ignition of wildfires. Also, a growing number of people live in new Florida communities and are building homes in areas that were once undeveloped and overgrown. The below-average rainfall for the last four to five months has significantly increased the state’s wildfire risk. Sarasota County Assistant Chief Fire Operations John Elwood warns that “lack of concern of fire safety measures can be disastrous. "As wildfires often begin unnoticed and spread quickly, residents can reduce risk to family, home and property by creating a family plan," he added. "Decide what to do and where to go before wildfires threaten." Most Florida wildfires are caused by lightning strikes. Arson and carelessly discarded cigarette butts also can cause wildfires. Remember, there is an ordinance against throwing cigarette butts and ashes out of vehicles. You could be responsible for damages your carelessness may cause. Ensuring that there is a cleared area around your house reduces the intensity and risk of a wildfire from spreading to your home. Defensible space helps to protect your home in the critical minutes it takes a fire to pass and also gives firefighters an area to work in. During a large-scale fire, when many homes are at risk, firefighters must focus on homes they can safely defend. Clearing flammable vegetation and debris and installing heat-resistant soffit vents will enhance your home’s chances to survive wildfire. Monitor your local radio and television stations for fire reports, evacuation procedures and evacuation centers. Keep an emergency checklist handy, and prepare to evacuate if your neighborhood is threatened. Proper preparation includes closing all windows and doors, arranging garden hoses so they can reach any area of your house, and packing your car for a quick departure. Store firewood, propane tanks or gasoline as far from the house as possible. Clean gutters and roof by removing leaf litter and pine needles. When planting foundation plants, keep a clear space at plant maturity of at least 2-3 feet from the side of the house. Use fire-resistant plants as much as possible. Do not dispose of yard waste, tree trimmings or dead plants on vacant lots. Make sure smoke alarms are in good working order in your home. Do not water your roof when a wildfire approaches your home. It places you in danger and reduces the water pressure for the fire hydrants. Have an emergency supply kit ready for wildfires or other disasters. When driving in reduced visibility, reduce your speed and drive with your headlights on. Florida residents and visitors who need the latest information about travel conditions during wildfires should call the Florida Department of Transportation’s (FDOT) free 511 Travel Information System. During times of limited visibility due to wildfires, travelers can get up-to-the-minute reports on major evacuation routes, bridge and road closures, and roadways with toll suspensions by calling 511 or visiting the www.FL511.com website.